The easiest way to add character and texture to your wall - Shaker style wainscoting, a classic wall feature with simple clean lines. Our Classic shaker wainscoting kits do not require panels, that's what makes them so easy to install. 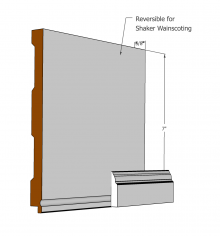 Although we only offer a few choices of pre-packaged kits, Shaker Wainscoting can quickly be configured for single, double or triple tiered applications. We offer all the Shaker trims and parts you need for Full Accent Walls, staircases, even curved staircase walls. No need for a table saw or router, all you need is a chop saw to make as many panels and tiers as you like at any height you choose. 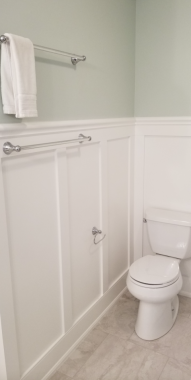 If your walls are not in good condition, consider our Flat Panel Wainscoting, this system is similar and does come with pre-cut panels to make installation just as simple. Every Elite Shaker Paneled Wainscot kit comes factory primed and ready to paint. 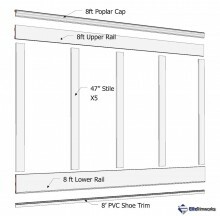 Everything you need comes in the box: a PVC shoe trim, lower and upper rails; stiles and a hardwood poplar cap trim to top it all off. Thinking of using a baseboard trim? 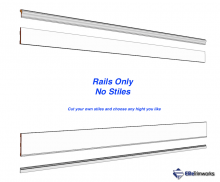 Our kits include a 2”, ⅝” MDF spacer which you may choose to place under the lower rail. By doing so, you increase the space between the top of the baseboard and the top of the rail. Ideally 3 ½” would be ideal, see the how to install instructions for additional details. Perhaps, if you're more adventurous, consider adding panel moulding to the inside of the panels. 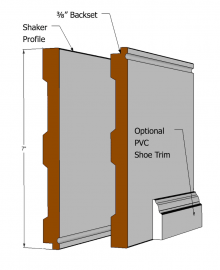 You may add additional, Panel Mould or Flexible Panel Mouldings for curved walls. To finish the job, apply one good coat of paint after installation and you're done. Most customers paint both the wall surface and all kit parts the same color. 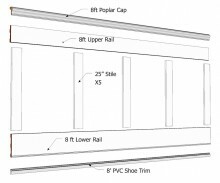 Need help with your layout or figuring out how much material you will need? Give us a call, our qualified design experts are standing by.